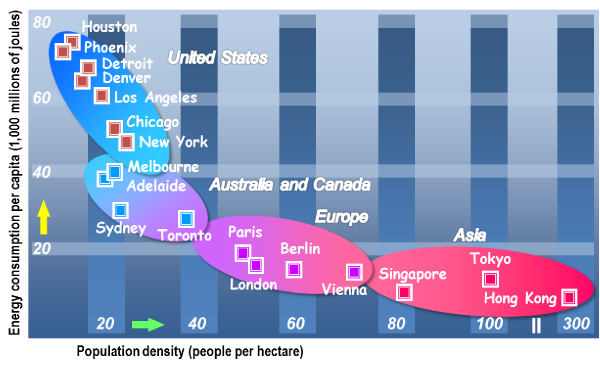 Ben Adam-Smith (@BenAdamSmith) alerted me to this chart which he stumbled upon whilst researching the vexed issue of density. Every good chart is designed to tell a story (and back it up with facts and statistics) but that doesn't mean they aren't capable of leading you down the garden path. And this is a good example of one that does. The chart sets out to show how greedy Americans are when it comes to energy and how the very design of their cities further exaggerates this largesse. 18 cities are compared on the basis of their energy usage per head and this is mapped against their population density. The result? The seven American cities are the seven largest energy hogs and also the largest land hogs. At the other end of the spectrum, the three Asian cities, Tokyo, Hong Kong and Singapore, are not only the three most energy efficient per capita, but also the three most densely populated. QED? The more densely populated a city, the more energy efficient it is. That, at least is the conclusion we are being drawn to here. But is it true? Let's dig a little. First thing that stands out is that the x axis and the y axis are comparing apples with pears. The key metric we are being asked to look at is the energy consumption per head. If we did this and this alone, we would have just a single line populated with 18 different cities, with Houston at No 1 spot with score of 75 and Hong Kong at No 18, with a score well below 10. Now that is already a remarkable observation. People living in Houston consume around ten times more energy per head than people in Hong Kong. This tallies with available national statistics on energy and CO2 emissions, though China no longer has such a low score. I suspect this chart is a few years old now and that Hong Kong's score would now be noticeably higher. But that's not the point. The chart then adds another axis showing the population densities of each of the 18 cities. Now this too is interesting as it draws us to the conclusion that the American cities are groundhogs and the Asian cities are space efficient, though note that two of the Asian examples chosen, Hong Kong and Singapore, are island city states and neither has that much space to expand so they are almost bound to be space efficient. My main nitpick is that these two observations which, in themselves, are demonstrably true are not necessarily connected, let alone causally related. They may be, they may not be. But the very fact of graphing them against each other draws us to the conclusion that a connection is there and it's a strong one. Indeed, it draws us to the conclusion that population density is the major factor in determining energy usage. And that dense development patterns are therefore a good thing — inherently sustainable even — and that in future development should take place on this sort of basis. Hong Kong good: Houston bad. It's an oft held criticism of American cities are that they are so large that they encourage car use — "LA is a great big freeway." In contrast, compact cities are walking cities, and they also make public transport more cost effective because there are more potential passengers within walking distance of each bus or metro stop. All true and good. And therefore transport energy costs are likely to be high in megacities which were developed after the advent of car use and cheap oil. Which is the point the graph is making. But transport costs are not the only energy costs. What about heating? And air conditioning? And manufacturing? And public buildings? Maybe, just maybe, American cities have more of these as well. Not to mention bigger houses. In fact, I'm sure they have all of these features, all much bigger than Asian homelets. I'm pretty sure you could chart energy consumption against average house size, or average incomes, or number of doctors per head of population, and get almost exactly the same looking chart. This is because Americans are, by and large, rich, certainly when compared to Asians and it's this factor which tends to give rise to space-hungry grid-iron street patterns, high levels of car ownership and heavy energy use per head. Their wealth also developed in a world of cheap energy in which no one gave more than a passing thought to how much energy they used, and a world of cheap land too, so it's hardly surprising that their cities developed as they did. In conclusion, it's not that this chart isn't accurate or even that it draws false comparisons, but that it's making an observation that tells us about the historical development of cities and dressing it up as lesson for us to learn about tomorrow's cities and developments. What I'm getting at is that a chart like this gets used as a manifesto to justify high density development when in reality it is just a bit of social history. You could, if you wanted to, create a low density, low energy neighbourhood: think green ribbons stretching across the countryside with everybody having a passivhaus on a one-acre plot and a bus up and down the lane every ten minutes. Or you could create the densest, most energy hungry development imaginable: think of the Candy Brothers' One Hyde Park, 86 apartments in central London in which, apparently, hardly anyone actually lives. So the moral from all this? Just because cheap energy leads to low density development, it doesn't follow that high density development will result in low energy use. Thanks for the mention and I've now got a much clearer grasp of why I was nearly led astray! "You could, if you wanted to, create a low density, low energy neighbourhood: think green ribbons stretching across the countryside with everybody having a passivhaus on a one-acre plot and a bus up and down the lane every ten minutes"
I want to! Now where in the UK can I buy this or even get a developer or a council to commit to it? It would be great if this was the sort of house we could buy off plan and once they had reached a critical mass of contracted buyers the developers can break ground! Thanks for pointer Mark, I'd not seen those before. The Abington Plotlands do look interesting although from Google maps it is obvious they are not anchored to a town or village at either end which would be essential for sustainability. It is also interesting to note that Google Streetview doesn't cover them. It looks like they have some kind of Private Road statement under their 20mph signs from the last available street-view image. Radiating green ribbons out from small to medium sized towns with good cycle paths and workplaces and/or live/work plots would seem a utopian solution for a lot of people but it appears to be what a lot of UK planning law was created to prevent from my understanding! Too right. UK Planning Policy was created to prevent precisely this sort of thing (ribbon development) happening. But it's a nice dream, nonetheless. At first I thought "what an interesting chart", but after your post I was quite disillusioned, because of course you´re right... Nevertheless one thing is catching my attention: Is Tokyo really that "energy efficient"?? I can hardly believe that!